Once upon a time the small building at 6116 S.E. Milwaukie Avenue in Westmoreland housed the dental office of A. Farid Boulori, who still practices dentistry in the City of Milwaukie, and who owns the mixed-use structure that took the place of the Black Cat Tavern at S.E. Umatilla and 13th Avenue in Sellwood. Since then, the structure has been home to a variety of cafés; and the latest – just opened – is a family-friendly bakery and café called "Communion Bakehouse", where recently had been "Satellite Dream Pizza". The new business offers indoor seating for 24, as well as 12 more chairs on the front patio for warm weather. Presently they focus on breakfast and lunch dishes, but this summer they hope to offer house-baked pizza as well. 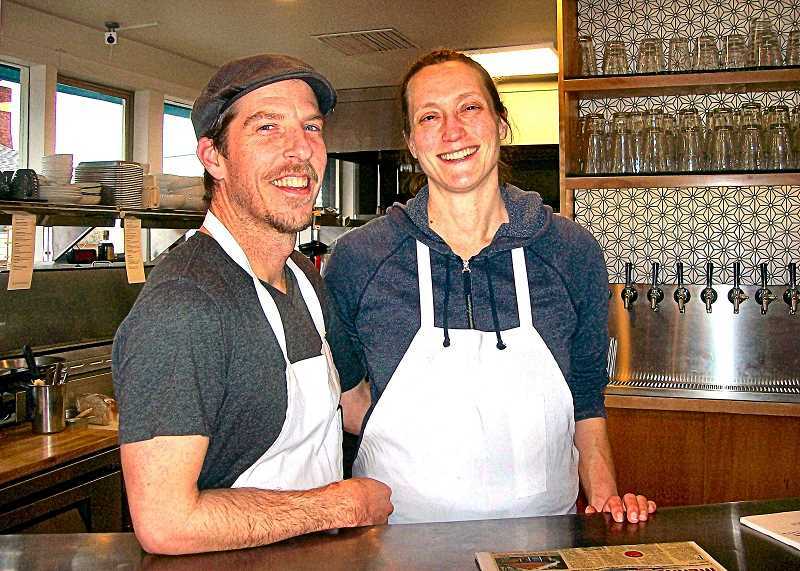 New owners are chefs Katharine Zacher and Ryan Ostler, who hail from San Francisco. Zacher has experience baking savory breads, scones, and Danish. Ostler, who has a background in Texas BBQ, will produce smoked fish, brisket, house sausage, and bacon. The two are also proponents of native fermentation, and use naturally-occurring yeasts for breads, pickles, and hot sauces. Zacher tells THE BEE, "We draw from many different cultures, and try to work in the elements we like the most – a lot of vibrancy, color, textures, and fresh herbs. I still love French pastry, but I like to spice it up a little. We're keeping it a bit traditional until the neighbors get to know us. Currently we're open Wednesdays through Sundays from 8 a.m. to 3 p.m., but in the summer, we hope to be open at night, too." Ostler adds, "We do a lot of 'the classics' here – with updates. We focus on freshness, and making everything from scratch. We live nearby, and did a lot of the remodeling here ourselves! We put in a rock garden out front, and will plant herbs along the front edge as soon as weather permits. Our reception by the neighborhood has been fantastic, in spite of the weather."